Humble and Fred Radio has been in the works for a while. In late July, Fred Patterson was dismissed by Corus, and the planning began in earnest. I managed to keep it completely on the QT until August 4th when I wrote Humble and Fred's Perfect Storm - A Radio Revolution? It's a perfect storm of sorts. There is a plan for Humble and Fred, a future for the duo. No, I'm not about to announce they're the new morning show for < insert station here >, but they are on the brink of what I believe is a radio revolution. Are you ready for Humble and Fred Radio? We planned our attack over lunch, and shared the specifics with you all shortly thereafter. Humble and Fred were to record a show every weekday and share it with the world. That's where I came in. I wanted to take care of the savvy first. The savvy would want to subscribe to the podcast, via iTunes or an Android or Blackberry app. Luckily, there's an RSS 2.0 specification they all accept, although iTunes does recommend some additional iTunes-only tags. This RSS feed is an XML file, so I wrote one, made it easy to update via the CMS and taught Freddie P how to update it each day. That feed can be found at http://www.humbleandfredradio.com/podcast.xml and was submitted to the iTunes Store for approval. We were approved and that's how we got our own iTunes Store page. If you're listening to the podcasts, you know there was a delay getting Thursday's episode in there. That's because Fred put the date as Thur instead of Thu. That's how sensitive the XML file is, but everything was corrected and updated by Friday afternoon. Speaking of the iTunes Store updating, that's one of the frustrations. iTunes reads our XML file to update their store on a schedule only known to them. So Fred might update the XML file at 1pm, but the iTunes Store might not update until 3pm. I've learnt there's nothing we can do to force this iTunes Store update. All we can do is update our XML file and ensure we're adhering to the RSS 2.0 standards. The XML file satisfies the savvy subscribers, but there are plenty of Humble and Fred fans who just want to click a play button and hear the show. I licensed a Wimpy MP3 player for this purpose, and it lives at http://www.humbleandfredradio.com/mp3player.html. After Fred updates the XML file that drives subscriptions, he updates this Wimpy player, dummy-proofed in the CMS, not that Fred is a dummy. In fact, as I learnt when we launched CanadianThinker.com, the man catches on quick! 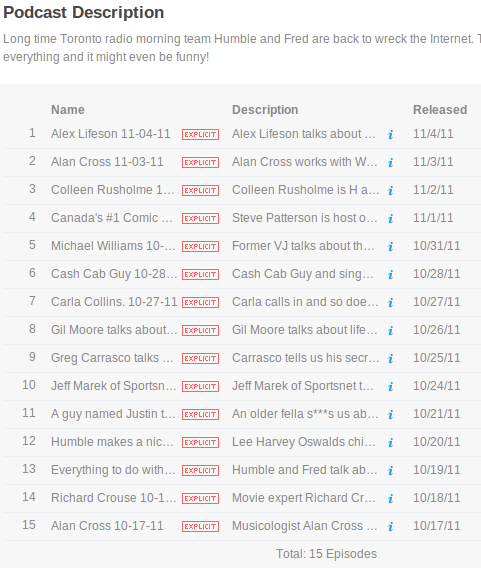 The Wimpy player lets you list several episodes, so someone can just pick their episode from the list. By default, it auto-plays the most recent episode, but you can pause it and come back to it anytime. I'll often play episodes this way when I'm hacking away on the computer. The XML file satisfies the subscribers and the Wimpy player satisfies most of the rest, but there needed to be one more catch-all that truly doesn't care what OS you're on, whether you can see Flash or not or what application you're going to use to play our MP3. I've been blogging 9 years because I love the format. Every entry gets a permalink that will never, ever change. That's the spirit behind this catch-all for sharing the Humble and Fred podcasts. After every episode is recorded, converted to MP3 and uploaded to our coreFusion server, that episode is given its own blog entry on HumbleandFredRadio.com. This permalink always includes a link to the MP3 file, so even if you can't see Flash on your device you can always download or stream the audio. I've yet to encounter a set-up where this didn't ensure Humble and Fred got heard. And that's how we do it. It's a three-prong approach, and I'm quite proud of the design. It's holding up very, very nicely, if I do say so myself. I grew up listening to Humble and Fred on CFNY, and I've been trying to find a morning show I like as much since they left for Mojo Radio. I'm honoured and tickled pink to be a part of Humble and Fred Radio, because it's the show I've been searching for this past decade. The boys are back, and if you haven't heard them yet, you really have no excuse. If you're listening, how do you access the audio? If you're not listening, why aren't you? This is actually very good info, thanks. Now that you've successfully done this would you be interested in some consulting work? I go straight to the itunes app on my ipod and download the shows from there. Easiest way to do it for me, although if I can I visit the website to watch the show promo before I actually listen to the show. Hey Mike - Like you, I spent way too many hours listening to the banter between Humble and Fred and loving all of it; never laughing harder than when they cracked each other up. After they left 102.1 and Mojo, it was torontomike.com that kept me up to date with the whereabouts of these guys. I tuned in to the Mix and EZRock...trying to stomach some of the music played just to hear them. And now, I couldn't be more thrilled to hear them together again - better than they were when on radio. Thanks to you for being a fan as well, and keeping us up to date on podcasts and firings...and now this, humbleandfredradio.com. I'm loving every minute! You're a bloody wizard, man! I have listened to some of the top podcasts on the comedy ranking chart and I would say that Humble and Fred radio tops most of them. I have been taking the right-click, save as route to listen to the .mp3 file. More often that not, that means listening to the file on one of my computers in Winamp. That may sound arcane to some, but I am fortunate to have a 12 minute commute against traffic. The show needs to be listened to to be appreciated; it's not just background sound, so listening on one of my phones doesn't cut it. Thanks for this. I can now listen on my Android. I was actually looking for this information on the hfr website. Might be a good idea to put it up there somewhere. I began by grabbing the podcast in iTunes for my iPod. I ran into a problem though. If I didn't completely listen to one episode, then grabbed another one, it never picked up where I left off the one I was listening to. Any attempts to fast forward took forever. All I do now is just grab the daily mp3, burn it to a RWCD daily and listen in the car. Not one complaint though... I look forward every day now to listening to the show on my way home from work! Keep up the great work everyone!! Once it's all running smoothly, I hope they will consider adding Podcast chapters and markers. Chapters would be very helpful. And they need to add the H&F Radio.com icon to the podcast. Question on downloading/bandwidth. I have DLed the podcasts through subscription to multiple devices, iPad, iPhone and laptop, mostly from my home connection. Does it count as 3 DLs on the servers or does it trace the IP and pair them all up and count it as one unique DL? Just out of curiosity. Anyway, loving the show. Was listening so intently the other morning I drove right through the drive thru without ordering. Was just laughing at how stupid I must have looked as I got to the window. And who sang the song from I think the Carla Colins episode. Think it was called 'it's all I want' or something like that? The audio file still doesn't show the proper playtime and the audio levels are still all over the place. Humble & fred come through clearly but everyone else is too low, including the sound effects. Other than that the show is great. In that instance, it would count as 3 downloads. Shhhh. Yes, there's a known encoding issue with the MP3 file itself that would explain that playtime discrepancy. It has to do with how Howard generates the MP3 file on his Mac. I'm promised we're getting somebody to fix the problem for us and we're sorry. We had a good laugh at "the guy" that was using Winamp while reviewing the log files today. That and the fact that RIM uses Mozilla for their browser on the Playbook. @Rob, if you subscribe to the podcast on a Mac and then "sync" your iPad or iPhone using WiFi, it will pull the file from your Mac, so it will only count as a single D/L. If you use a Windoze PC, or not use WiFi it will count as 3 D/L's as Mike mentioned. Another screw up on the Nov 08 podcast. It's listed as 7+ hrs. All the botched xml file shows won't play on my iPod Shuffle (current gen). H&F Radio is announced by the voiceover, but there is no podcast. They load ok on my iPhone, but not on the Shuffle. Isn't there 1 experienced podcaster in Toronto who is also a H&F fan/listener who would help these guys out? We only fixed the MP3 encoding issue today. That's why you see yesterday's episode as 7+ hours. Henceforth, all players will show the correct duration. And the XML file is fine. It validates with Apple. Remember, it's iTunes that reads the feed, not your Shuffle. I'm guessing your issue is that encoding issue we've fixed. Minor annoyance, but recently, my Shuffle voiceover for the H&F podcast just says 'podcast'. It used to say 'humble and fred radio.com'. Once again- MP3 encoding error. Thurs show was listed as 5+ hrs. Didn't load on my shuffle, as usual.